The Jousting Life: More Information and Video from "The Grand Tournament of St Charles"
Since the post announcing Andre Renier the winner of "The Grand Tournament of St Charles" was completed at 4am after several days and nights of hard work and was therefore a bit scant on information, here is an expanded post about the tournament that took place as part of the "Festival of the Horse & Drum" on August 17 & 18, in St Charles, Illinois. For the first portion of "The Grand Tournament of St Charles", all eight of the competitors ran a Mounted Skill at Arms(MSA) course. Videos of all eight MSA course runs are now viewable on "The Jousting Life" YouTube channel. However, here are videos of the two jousters who tied for second place on the MSA course: Steve Hemphill on his Friesian cross mare Tinkerbell and Andre Renier on his Percheron gelding Chevy. As mentioned in a previous post, Australian jouster Sarah Hay on Riley and US jouster Stacy Wasson(one of the Awesome Wassons) on Solovino tied for first place in the MSA portion of the competition. Steve Hemphill on Tinkerbell and Andre Renier on Chevy tied for second place. Jeffrey Basham on Pooh Bear, Jeff Wasson(the other Awesome Wasson) on Solovino and Scott Wilson on Tanner tied for third. In fourth place was Chris Greenway on Angel. Another portion of the tournament involved a Mounted Melee which was included as part of the "Festival of the Horse & Drum's" Saturday evening "Extravaganza". Unfortunately, the video of the first few minutes of the mounted melee competition did not come out very well, but here is the video(still not great, but viewable) of the last few minutes. As you can hear, the children standing next to me as I filmed this video were very excited. The Mounted Melee depends a great deal on each competitor's honour. Although different melees have different rules, in this melee, each competitor fought until they felt that they had received five solid blows. At that point, they placed their melee baton horizontally across their head declaring themselves out of the competition and removed themselves from the field of battle. Stacy Wasson graciously agreed to give up her chance to earn points in the melee in order to act as the mounted marshal. The mounted marshal is there to keep an eye on things and, in the rare case of a competitor not withdrawing even after it is obvious they have received multiple blows, to remove that competitor. In the tilting portion(what most people refer to as the actual jousting) of the competition, as mentioned in the previous article, Sarah Hay earned first place riding Andre's Percheron cross gelding Riley. 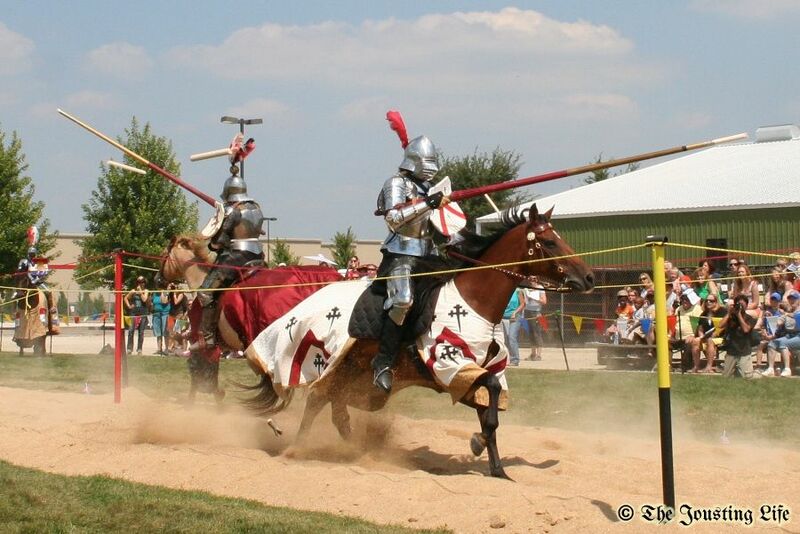 Jousters who travel long distances to compete in a tournament(especially those who travel overseas) are dependent on others to loan them horses to ride. It was extremely generous of Andre Renier to loan Sarah his most experienced jousting horse, the horse that was eventually awarded the title Champion Horse of "The Grand Tournament of St Charles". 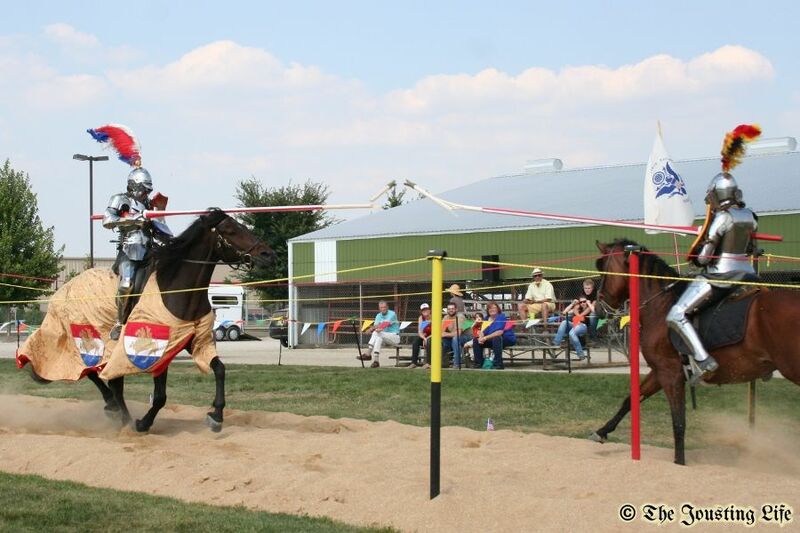 Steve Hemphill, riding his Friesian cross mare Tinkerbell, and Jeffrey Basham(Isn't that a GREAT name for a jouster? ), riding his quarterhorse mare Pooh Bear, tied for second place in the tilt. Stacy Wasson, who most times rode the borrowed Azteca stallion Solovino, earned third place. 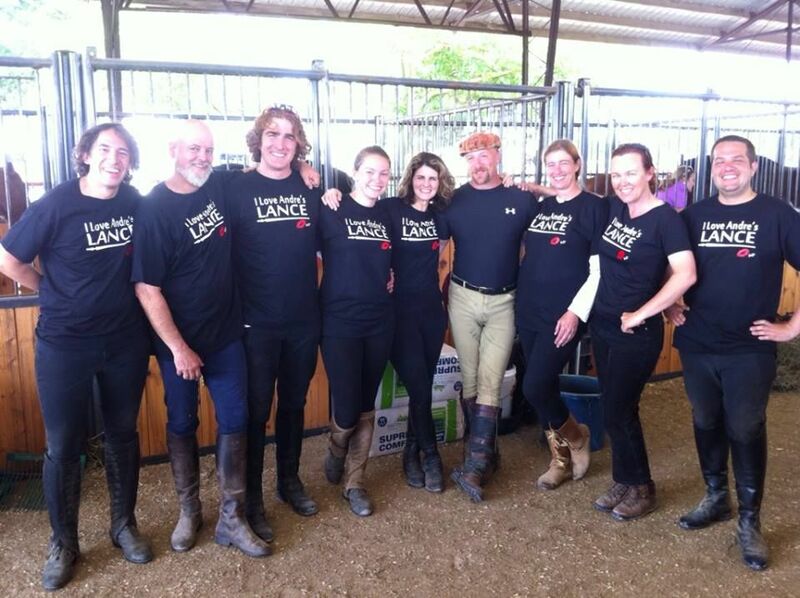 Due to various circumstances, Stacy ended up riding a total of four different horses(Solovino, Tanner, Chevy and Tinkerbell) in five different saddles during the course of the tournament. Riding multiple horses during a tournament, especially unfamiliar horses, is very challenging, and Stacy deserves kudos for how well she did riding a variety of horses. In the following video, you can glimpse Stacy, wearing a red and gold feather crest on her helm and riding the Percheron gelding Chevy with his red saddle pad, breaking her lance against Steve Hemphill whose colors are blue, black and white. Andre Renier, riding his secondary jousting horse, the Percheron gelding Chevy, came in fourth place. In fifth place was Jeff Wasson, who mostly rode the "loaner horse" Solovino, but also rode other horses occasionally(he also deserves kudos). Scott Wilson on his Appaloosa Gelding Tanner, came in sixth. And Chris Greenway in his first competitive jousting tournament, riding his quarab mare Angel, came in seventh. If one were to go strictly by the points earned during the equestrian part of the competition, the list of overall winners would have been as follows: Sarah Hay would have earned first place. Steve Hemphill and Jeffrey Basham would have tied for second place. Stacy Wasson would have earned third place(the two female jousters did extremely well for themselves). Andre Renier would have earned fourth place, Jeff Wasson fifth place, Scott Wilson sixth place and Chris Greenway seventh place. However, the organizers of the this tournament decided that they wanted to include chivalry/sportsmanship/popularity as part of the overall scoring system. When those points (which were awarded by the jousters, ground crew and judges) were added to the equestrian competition scores, Andre Renier was the winner by a landslide. Andre and his newly designed lance, which was slightly lighter and had a more tapered base than previous lances, were so popular that several of the competitors designed and had made(during the course of the tournament) a shirt specifically stating their appreciation for Andre and his lance. Pictures from Friday's jousting practice are already posted on "The Jousting Life's" Facebook page in the album "Festival of the Horse & Drum 2013 Friday Practice". More pictures will be posted as they are sorted and edited. 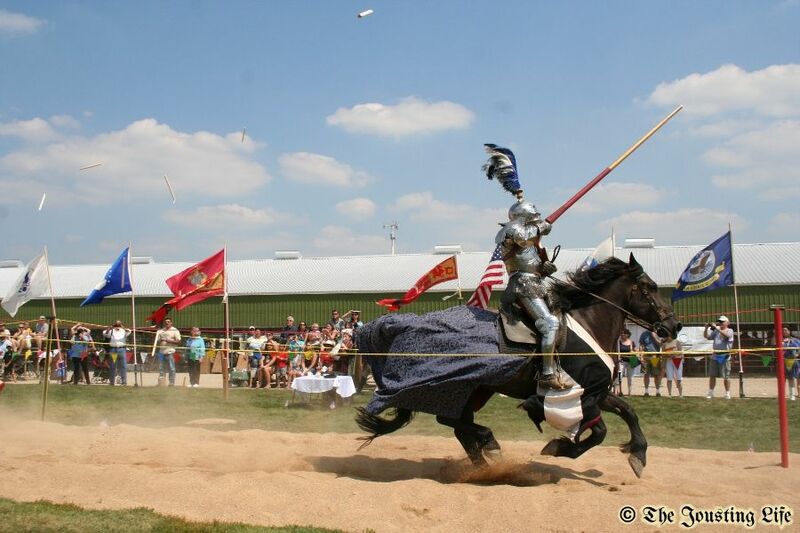 Since people have been asking for more information about the horses used in jousting, there is an article in the works about the horses used in "The Grand Tournament of St Charles". Look for it in the near future.